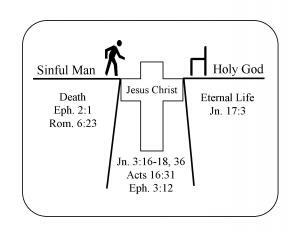 1 John 5:11-12 - 11And this is the record, that God hath given to us eternal life, and this life is in His Son. 12He that has the Son hath life; and he that hath not the Son of God hath not life. This passage tells us that God has given us eternal life; this life is in His Son, Jesus Christ. In other words, the way to possess eternal life is to possess God’s Son. The question is, how can a person have the Son of God? Isaiah 59:2 - But your iniquities have separation between you and your God, and your sins have hid His face from you, that He will not hear. According to Romans 5:8, God demonstrated His love for us through the death of His Son. Why did Christ have to die for us? Because Scripture declares all men to be sinful. To “sin” means to miss the mark. 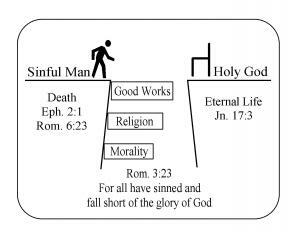 The Bible declares “all have sinned and come short of the glory (the perfect holiness) of God” (Rom. 3:23). 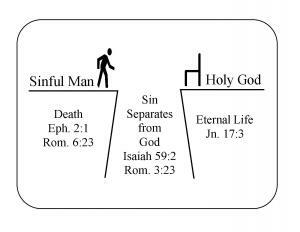 In other words, our sin separates us from God who is perfect holiness (righteousness and justice) and God must therefore judge sinful man. Habakkuk 1:13a Thou art of pure eyes than to behold evil, and canst not look on iniquity. In other words, Lord your eyes are too pure to approve evil, and Lord you cannot look on wickedness with favor. Ephesians 2:8-9 8For by grace are ye saved through faith; and that not of yourselves: it is the gift of God. 9Not of works, lest any man should boast. Titus 3:5-7 5Not by works of righteousness which we have done, but according to his mercy he saved us, by the washing of regeneration, and renewing of the Holy Ghost; 6Which he shed on us abundantly through Jesus Christ our Savior; 7That being justified by his grace, we should be made heirs according to the hope of eternal life. He saved us, not on the basis of deeds which we have done in righteousness, but according to His mercy, by the washing of regeneration and renewing by the Holy Spirit, whom He poured out upon us richly through Jesus Christ our Savior, that being justified by His grace we might be made heirs according to the hope of eternal life. Romans 4:1-5 1What shall we say then that Abraham our father, as pertaining to the flesh, hath found? 2For if Abraham were justified by works, he hath whereof to glory; but not before God. 3For what saith the scripture? Abraham believed God, and it was counted unto him for righteousness. 4Now to him that worketh is the reward not reckoned of grace, but of debt. 5But to him that worketh not, but believeth on him that justifieth the ungodly, his faith is counted for righteousness. Romans 4:25 25Who was delivered for our offences, and was raised again for our justification. 2 Corinthians 5:21 21For he hath made him to be sin for us, who knew no sin; that we might be made the righteousness of God in him. If you have just trusted in Christ, you need to learn about your new life and how to walk with the Lord. Will you contact us and we will take you step-by-step through some basic truths of God’s Word and will help you build a solid foundation for your faith in Christ.